Miami Marlins pitcher Caleb Smith stands on first base after an RBI single against the San Diego Padres Saturday at Marlins Park in Miami. 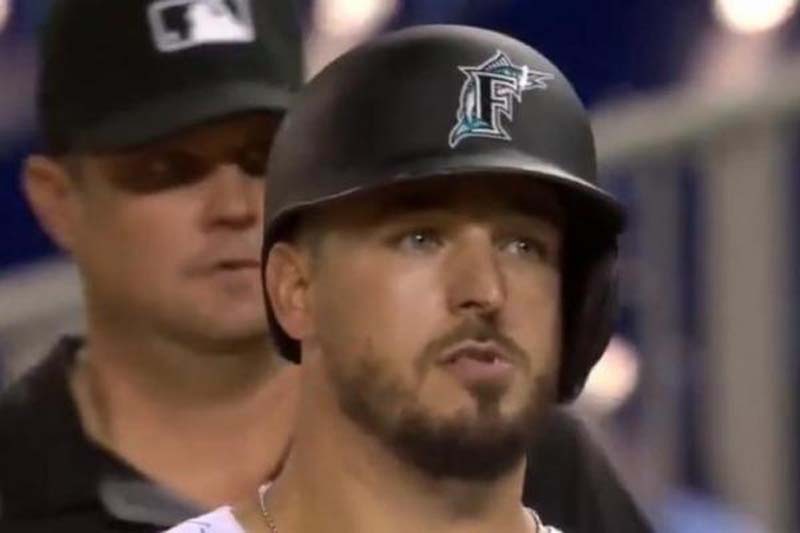 Caleb Smith had a great night on both sides of the plate in a Miami Marlins win against the San Diego Padres. The Marlins' southpaw starter allowed four hits and had six strikeouts in five shutout innings to earn the win on the hill in the Marlins' 4-0 triumph Friday at Marlins Park. He also swatted his first career hit, an RBI single in the fourth inning. Smith's single may have been accidental, but the result was him slapping an inside fastball to the opposite field and plating the Marlins' second run of the game. He was 0-for-16 in his career at the plate before the swing. "He put it in play finally," Marlins manager Don Mattingly said. "We were trying to get him to pull the ball foul down the third base line and he ends up hitting it over there. So he's a little late getting started but he battled tonight ... He actually gets frustrated when he doesn't get hits so it was good to see him go out and get one." The Marlins got their first run in the third frame. Lewis Brinson hit a sacrifice fly to left field off of Eric Lauer, plating Justin Bour on that play. Lauer walked Yadiel Rivera in the next exchange, before allowing the hit to Smith. Miami got a third runner home in the fifth frame when Lauer walked Rivera again, with the bases loaded. Marlins catcher J.T. Realmuto brought home the final run of the game when he hit into a grounder, but beat the throw to first base during a double-play attempt. The Marlins bullpen held strong over the final 3.2 innings, allowing two hits and tossing five strikeouts. Brad Ziegler earned a hold in relief. Smith was 1-for-3, with an RBI and a strikeout at the plate. Brian Anderson went 3-for-5 for the Marlins. The Padres and Marlins face off in the second game of the series at 4:10 p.m. Saturday in Miami. "I'm proudest of the first hit, definitely more proud of that today," Smith said. "I think [Brad] Ziegler deserves the win today. He came in and saved me so he did a good job."